The success of tooth replacement with dental implants depends on a solid connection between the implant and your jaw. 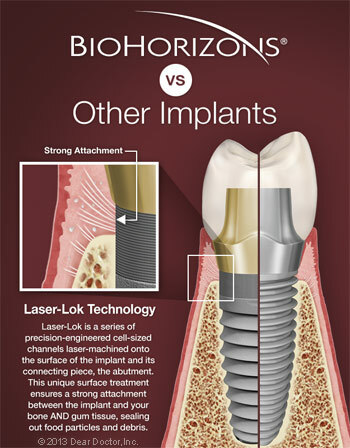 To maximize this connection, we use BioHorizons dental implants. 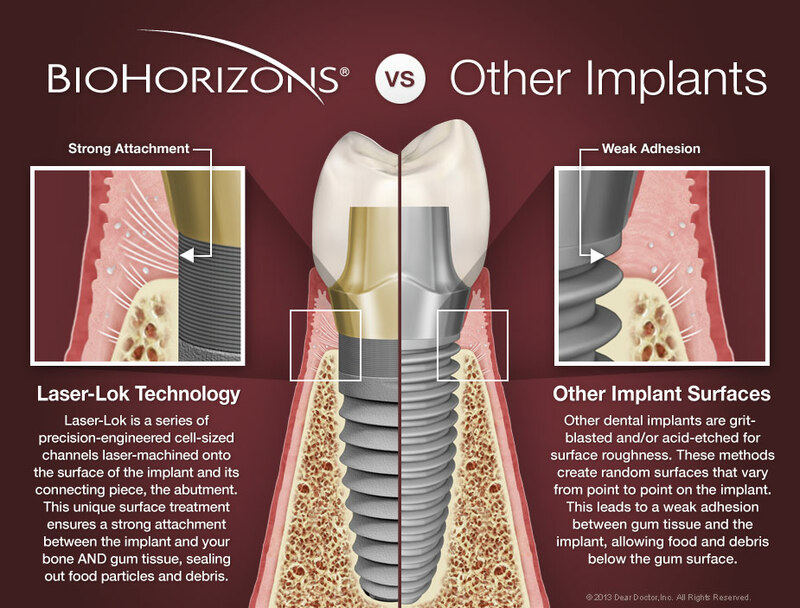 Implants made by BioHorizons have a uniquely engineered thread design that allows them to achieve initial stability second to none. That enhanced stability allows you the opportunity to get new teeth the same day your implants are placed. In addition, only BioHorizons implants have a proprietary technology called Laser-Lok at the gum line area, which is truly a remarkable innovation. Laser-Lok is a series of cell-sized microchannels that are precisely carved around the upper implant surface with a laser. While virtually all implants on the market have a roughened surface to promote attachment of bone cells, only Laser-Lok channels are optimally sized to attach both bone cells and gum cells. The stability this creates is unmatched and is thought to provide the best environment to resist future gum recession. Also, research has shown Laser-Lok to be more effective than other implant designs in reducing bone loss. For more than 20 years, BioHorizons has been committed to providing the most comprehensive line of evidence-based, scientifically proven dental implants and tissue-regeneration products. Throughout the years, BioHorizons has consistently applied biomedical engineering to numerous product innovations and today is the proud owner of 24 unique patent awards. Numerous research studies have demonstrated their unparalleled success. That's why all BioHorizons implants carry a lifetime warranty. Using BioHorizons dental implants, we have achieved the highest possible success rates with the fewest postoperative problems. That's why we invest in this particular implant system. Of course, to achieve the outcomes this system is capable of delivering, you need to take care of your implant teeth as directed. Remember: advanced technology, while highly desirable, is no substitute for regular checkups and dental cleanings. Contact us or schedule an appointment to see if dental implants are right for you.